What you Would have Learned in School, IF you had Computers in School! Click Here for the 2014 “Tech Camp” offerings at the Escapade in Goshen. For those who didn’t have computer class when we were in school! This hands on class will fill in those holes in your knowledge. Using your own PC laptop, we present 6 topics over 4 sessions, complete with hands-on exercises. Wi-Fi and Web browsing, Know your Laptop, Word Processing and Filing, Maintenance and Safe Computing, Email, Open Session Q&A. Your laptop must have Windows 7 or Vista – no Windows 8, no XP, and no Macintosh. 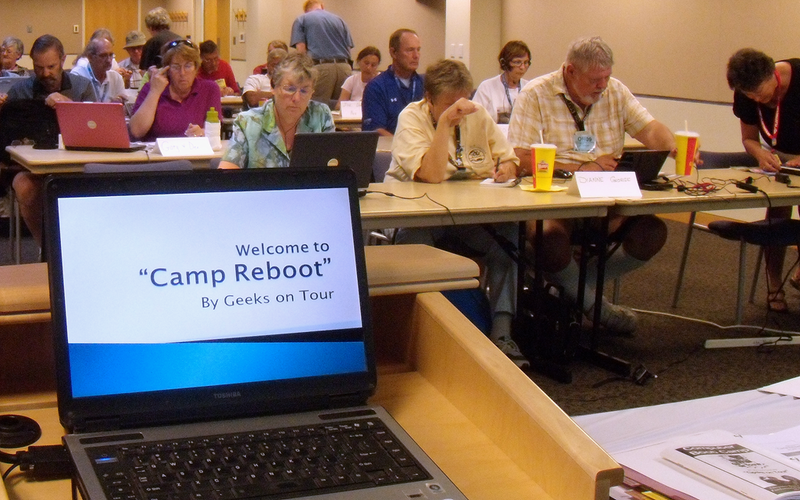 If you want to be more proficient with your computers, attend our hands-on boot camp. The teaching is geared to beginners but not complete beginners – you need to already be comfortable with the mouse and minimizing/maximizing/closing windows. We find that people who have used their computers for years learn a lot as well. This is for Windows-based computers – either Windows 7 or Windows Vista, no XP or Macintosh. The materials for the class include a printed workbook and a DVD of tutorial videos. The pre-Escapade workshop begins June 28, 2013 with the first session at 1 pm and continues thru Sunday Morning, with lots of fun time in-between! We picked topics that we consider the most important foundation for any computer user. Each topic consists of 3 parts 1)demonstration 2)hands-on assignment; 3)review. How to write a letter with software on every computer (WordPad), save it, and find it again. How to print it on someone else’s printer if you don’t have one by copying it to a USB drive. File Management, using Windows Explorer, folder structures, finding files, copying and moving files, identifying file types. How to Use WiFi to get online and browse, search, set up favorites. This is for Windows-based computers – either Windows 7 or Windows Vista – sorry, we can’t include any Windows 8, XP or Macintosh. A ‘topic’ consists of 3 parts 1)demonstration 2)hands-on assignment; 3)review. You bring your own (Windows-based) laptop computer. The price includes instruction from both Jim and Chris Guld (Geeks on Tour), an exercise workbook, a DVD of video tutorials. and we encourage attendees to become members on the Geeks on Tour website. That way, they can watch more tutorial videos and ask questions in our forum. The learning continues! Call Kim today and get registered! Would love to attend. What if you sign up and for emergency reasons can not make it. How many a year do you have and where? Sounds like a very valuable, usable session. Cannot attend the CampReboot in MO. Will you have a similar one in FL? will you ever come near Oxnard CA? I learned a lot from you in one morning and would be interested in attending this if we can make the Escapade.